Ocean Grove is one of the major holiday destinations on the Bellarine Peninsula – and as locals, we all know why.. it’s welcoming, it’s reinvigorating and it’s absolutely beautiful. As the tourism numbers grow each year, so does the need for accomodation – and sometimes it’s nice to treat yourself to a bit of luxury every now and then right? Enter, Ocean Grove Chalet. This newest and luxurious hotel is set to be the first and only accommodation of its kind on the Bellarine. 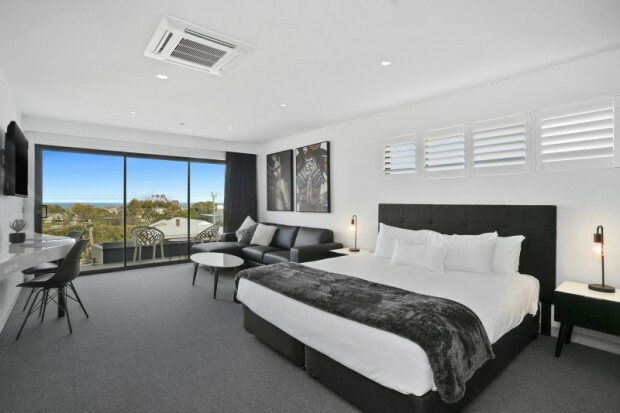 The $6 million dollar building completed by local award winning Le Maistre Builders boasting beautiful sea views, will open its doors to guests in December 2018. “Mark Le Maistre had the vision and we were overjoyed to be apart of a project such as this, and combine forces with a wonderful family and quality builders such as Le Maistre’s,” says Ocean Grove Chalet co-owner Mark Edmonds. “People within local tourism, constantly mentioned the lack of accommodation on the Bellarine compared to the Mornington Peninsula, which made us think the Chalet could be the perfect solution. The Chalet, which pays homages to the original Ocean Grove Chalet built in 1887, comprises 15 rooms in total, including two penthouses and four family-friendly rooms sleeping up to five people. The guest house originally stood on the corner of President Avenue and The Terrace before being demolished in the 1960s to make way for new developments. Guests will be provided with quality facilities such as a solar heated outdoor pool and spa, undercover parking, 24-hour video surveillance and lift access to cater for all visitors. The hotel is located at 99 The Terrace and is just a 100-metre walk from the idyllic Main Street and a stones through to the steps of Ocean Grove main beach.